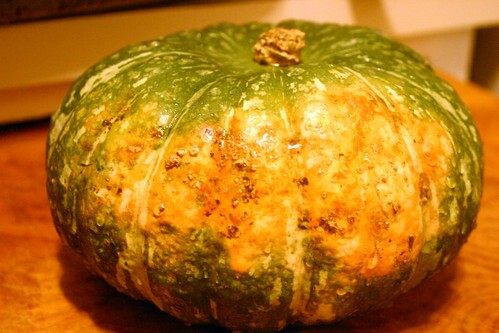 Lumpy, warty Kabocha squash is one of my favorite winter squashes. 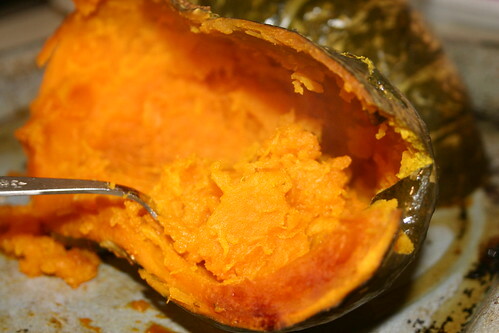 Sweet, understanding and forgiving in the kitchen, Kabocha makes a fantastic cooking companion. When picking out a Kabocha squash from your farmer’s market or grocery store, choose one with firm skin and a woody stem. 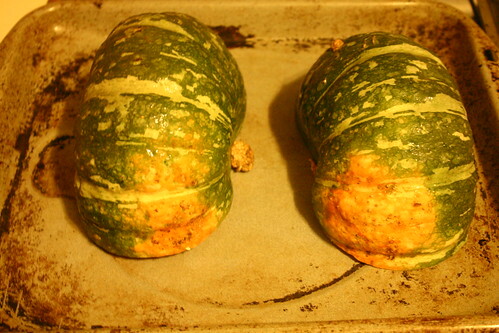 After I scrubbed and rinsed the outside of the squash, I split it in two and roasted it in a 375 F degree oven for 30 minutes, until it was fork-tender. After removing the squash from the oven, my kitchen was perfumed by its scent- creating a quintessential autumn kitchen. 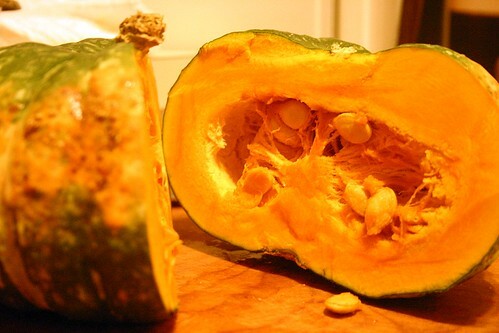 The Kabocha effortlessly gave up its seeds, leaving behind vibrant, marmalade colored sweet meat. After discarding the seeds and scooping out the steaming flesh, the outer shell of the gourd stayed mostly intact, resting like a helmet on the roasting pan. With a squash this easy to cook with, it was hard not to think of other ways to utilize it other than soup. At the same time I roasted the Kabocha, I roasted chopped onions and carrots tossed in olive oil and salt and pepper in another pan, until caramelized. After sauteing three cloves of garlic, fresh ginger, one Thai chili and two stalks of chopped celery in a large pot with olive oil and dried herbs, I added the roasted vegetables with the squash with four cups of chicken stock and simmered for another 20 minutes. Once the soup took on the characters I was looking for most, then I pureed it in a blender until smooth. 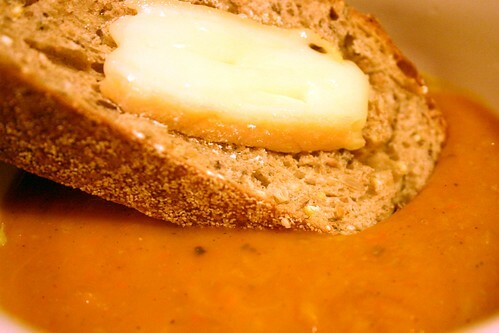 served the Kabocha squash and ginger soup with toasted multigrain bread, smeared with a French triple cream brie. The pungent cheese paired with the warm, sweet ginger spiced soup couldn’t have been more ideal for a Northwest rainy, blustery November evening. Looking for an autumn soup, or perhaps a starter to your Thanksgiving meal, try experimenting with the delicious Kabocha squash. Blog also posted on the Foodista blog.